This is a blue leather-like album from the Postal Commemorative Society. It contains First Day Covers affixed with memorial stamps issued in 1997 and 1998 by foreign governments from around the world. This Collection has 20 covers, stamps, and descriptions. Each is in a plastic protector sheet. The album also contains several empty plastic protectors labeled for some of the ones I don't have. Vincent and the Grenadines, St.
Lucia, Marshall Islands, Grenada Grenadines, Central African Republic, Guyana, Grenada, Nevis, and Honduras. The album and covers are in mint condition. 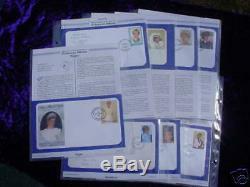 The item "Princess Diana First Day Cover Collection. New" is in sale since Saturday, January 22, 2011. This item is in the category "Collectibles\Historical Memorabilia\Royalty\Princess Diana". The seller is "hugosgallery" and is located in Sylva, North Carolina.